Writing is my favorite subject to teach. 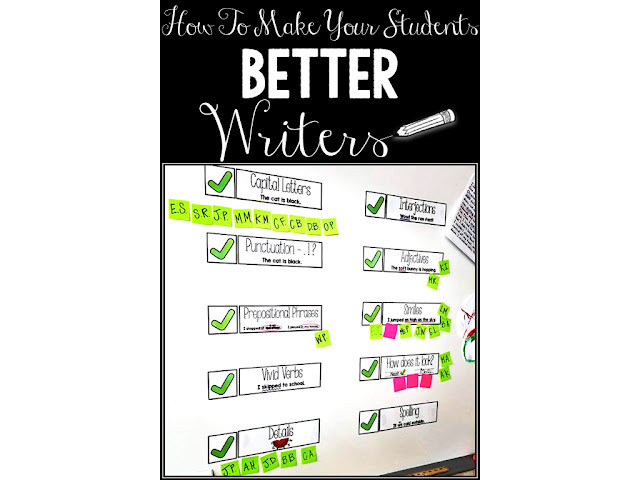 For years though, I struggled with getting my kids to edit and revise to improve their writing. I would rock my mini lessons and my model writing, they would rock in their understandings, they would knock out some decent drafts, and then the writing process would stall out. They could not get past the stage of drafting independently, they relied on me to tell them how they could improve their writing. And I was one teacher with, this year, 29 students... so they were waiting a lot. Now, they don't wait for me anymore. They are masters of their writing process, they have found their voices as writers, and they are confident that their work is the best it can be. Let me explain how we got to this beautiful place. To start a writing lesson, I have a specific writing skill focus. In the beginning, I start with some conventions like using capital letters, punctuation, finger space, neat letter formation. Then I move into some more content based skills like using adjectives, vivid verbs, similes, dialogue, etc. to enhance writing. I introduce the new skill, model it, then have my students begin the process of planning and drafting independently; their opportunity to "try on" the new skill. The end of this drafting time is where my students used to come up to me with those words every teacher dreads hearing... "I'm done!" Oh darling, you are most certainly not. Introducing... The edit and revise wall. On this wall, my best and most favorite wall, are each of our writing skills (added as we learn them) in checklist form. You might be saying, "Big deal. I have all my skills posted too. The kids NEVER look at them." 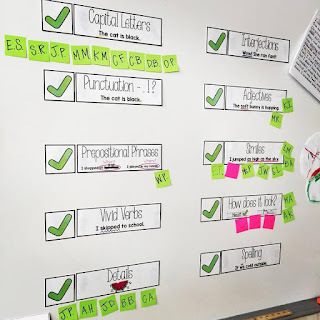 But THIS wall is not just there, it is a guide that is used daily to lead kids through the editing and revising process. Each skill card has an example, along with a marking to note the example. For instance, the adjective skill card below with the adjective underlined in red. During the editing/revising phase of the writing process, students independently re-read their writing, and mark each time they used an adjective by underlining them in red. As they read, with adjectives as their focus, they will think of new places to add adjectives, they will revise to use better adjectives, or they will notice that they haven't used adjectives and realize that they should probably add some to enhance their writing. This act of "marking up" their draft draws a new level of attention to their writing. They continue down the list of skills on the edit and revise wall, editing, revising, and marking up their drafts until they are sure their writing is the best it can be, that they have done their absolute best to approximate use of all of the writing skills they know. When it comes time for me to confer with my students, we take a look at a "marked up" piece of writing. Together we take notice of markings that there are few or none of, and students set a goal for themselves. We put a sticky note with their initials right up on the edit and revise wall next to the skill they need to work on, to serve as a reminder of their goals. Then the next time they draft, they have that skill, their goal, in the forefront of their mind. Now, if a student tries to come to tell me that they are "done", (they know better by now! ), all I have to do is point to the wall, and remind them that they have the skills to improve their writing on their own. This process has been huge for my students. It pushes them to take ownership of their writing and of the writing process, and to take ownership of their goals. And subsequently, it has made them better writers. For a more detailed look at my editing and revising skill cards, click here. Data collection in the 21st century. Plickers is my new best friend. Plickers, you make individual data collection so easy. Goodbye grading paper exit tickets every day. Goodbye paper and pencil pre-assessments that I have to take home on the weekend and spend hours grading. Goodbye moans and groans when it's time to take a quiz. Hello Plickers! 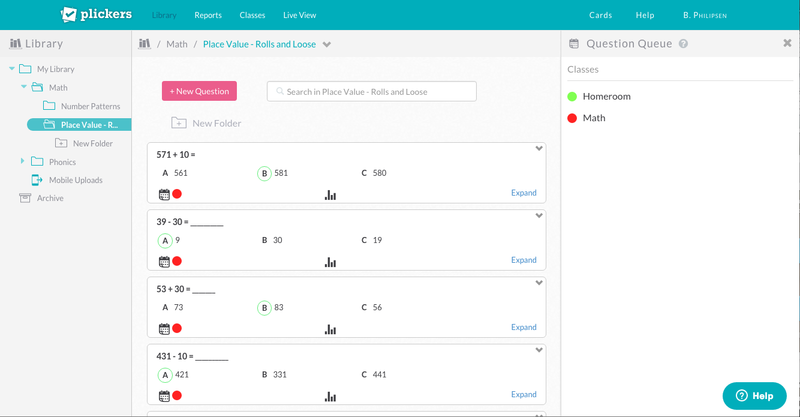 Plickers describes themselves as, "... a powerfully simple tool that lets teachers collect real-time formative assessment data without the need for student devices." It is an app/website that collects individual student data in seconds and sets it right in front of your pretty little face. When I first visited the website, I didn't quite understand what that would actually look like, so let me do my best to explain it in my own words. Then, type up (or insert pictures of) some multiple choice problems. Prints out a set of QR codes, one per student. 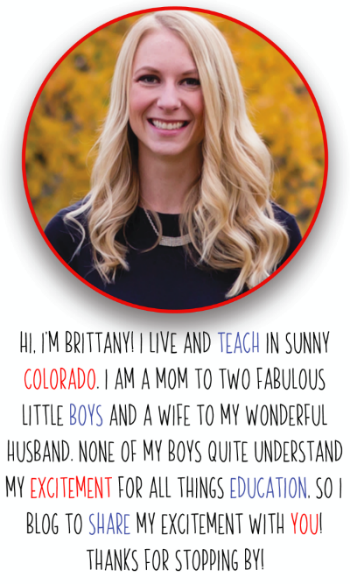 You can laminate them or print on cardstock so they can be used over and over. Each 4-sided QR code has answer choices A, B, C, and D around the sides. Students have an assigned QR code card, unique to them (numbered). Next, you open the Plickers website to project problems for students. Then, open Plickers app on your phone or iPad and select the first question. The question is projected through the computer/projector. Students turn and hold up their QR code with their answer (A-D) at the top. Now, you click "scan" on the app, and scan across the room while the app magically finds student answers by scanning the direction of their QR code. When all students have been scanned, you click the check mark button and... voila! Data! 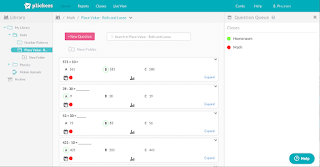 Now you can make re-teach or enrichment groupings in the blink of an eye! It is so easy, you guys. And so fun. And so amazing. And I love it so much I'm using conjunctions at the beginnings of my sentences. Another really cool feature is that you can insert pictures as your questions, and then just type in the answer choices. 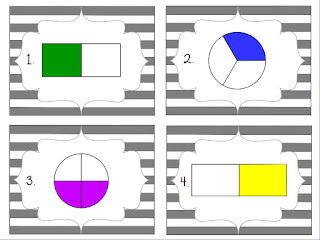 I'm currently working on prepping some fractions questions for an upcoming math unit using screenshots of some of my fractions task cards! So. Easy. Oh, how have I not mentioned this yet... Plickers is 100% FREE! I know. You can't even deal. Go! Get set up NOW. You won't regret it.